Can I generate a file containing all my invoices for the quarter (to send to my accountant, for example)? 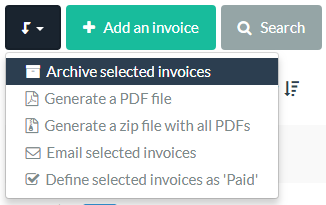 Yes, you can generate a file containing as many invoices as you wish. For that, you have to select all the invoices concerned in your list of invoices and then click on the arrow > Generate a PDF file. You will get a PDF file containing all the selected invoices one after the other, to be send quarterly to your accountant, for example. You can also create a zip file containing all PDFs. You simply have to select the right option.